In this section we’ll look at how to build a small console application that will display all the entities in the Product table. This application is similar to the one that you built earlier to list tables in storage accounts. The code in listing 1 will return all entities in the Products table and display the result in the console window. The code in listing 1 is pretty much the same code as in this listing (which listed all the tables in a storage account). The only modification you need to make to that code is to change the URI for the HTTP request at to the URI of the Products table. The REST API call that you used to list all product entities adheres to the AtomPub protocol, so the result that’s returned to the console window will display the entities from the Products table in Atom XML format, as shown in the following listing. The Atom XML output in listing 2 returns all entities stored in the Products table (RedShirt and BlueShirt). As you can see, the returned XML is very descriptive (and also verbose), including the name of the property, the value, and the data type. The verbosity of the returned XML means that the returned datasets are usually pretty large. You should be careful to cache data whenever possible and return the minimum amount of data required. 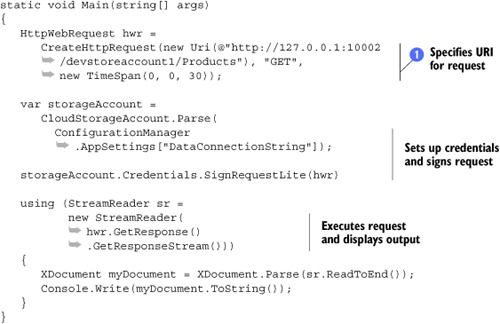 Hopefully, in the future, the Windows Azure Table service team will support a less verbose serialization format, such as JSON, and will also support local data shaping (explained later on in this section). JSON would be an ideal format to support because WCF Data Services (but not the Table service implementation) already supports this method of serialization. "Description" : "a Blue Shirt"
As you can see, the JSON representation is much more readable and terse, meaning that the size of the returned documents would be greatly reduced and will therefore improve the speed of your application. Hopefully this will be supported in future versions of the Table service.